Knopf Books for Young Readers, 9780553511239, 272pp. Captain Natick does not want to take a kitten on board his ship when it sets sail in 1837, but his daughter convinces him that the scrawny yellow cat will bring good luck. Onto the ship the kitten goes, and so begins the adventurous, cliff-hanging, lucky life of Jacob Tibbs. At first, Jacob’s entire world is the ship’s hold, where the sailors heave their heavy loads and long-tailed rats scurry in the darkness. 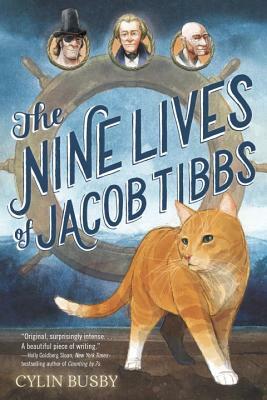 But before long, Jacob’s voyage takes him above deck and onward to adventure. Along the way, Jacob will encounter loss and despair, brave thunderous storms at sea, face down a mutiny, survive on a desert island, and above all, navigate the tricky waters of shipboard life and loyalties. CYLIN BUSBY is the author of several fiction and nonfiction books for young readers. Her memoir, The Year We Disappeared—co-written with her father, John Busby—was a Wall Street Journal bestseller, a Publishers Weekly Best Book of the Year, and a Cybils Award winner. While living on a farm in Tennessee, Cylin’s family kept more than twenty cats in the barn, whose job it was to keep the livestock feed free of vermin. The cat in this book is based on one of those cats—Graybeard—who was born a feeble, sickly runt and went on to become a great mouser. Cylin lives in Los Angeles with her husband and their son. Learn more about Cylin at cylinbusby.com.